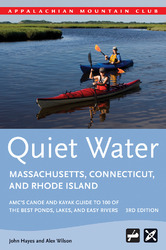 AMC Quiet Water Canoe Guide - Massachusetts/Connecticut/Rhode Island, by Alex Wilson and John Hayes, 3rd Edition, 2014. The AMC Quiet Water Guides describe numerous lakes and ponds and easy rivers where canoeists of all experience levels can find great calm-water paddling. Each entry includes driving and put-in directions, descriptions of paddling routes, sketch maps, safety and equipment tips, and natural history essays on waterside flora and fauna. This guide leads you to more than 100 southern New England paddling spots. 384 pp, 6” x 9”.